It's been far too long since my last post, though I can't say that life has been boring in the interim. First off, I'd like to thank Gamasutra for featuring both of my previous posts, Computer Science Vs. Game Development and The Cost of Education, it's amazing that anyone cared about my random musings here, and I appreciated all of the conversation it spurred. With life being so hectic as of late, I decided to go with another rant piece this time, I'll get technical next time. With that said, let's get to it. Recently, I had cause to take a week off from work and stay at home for a while. 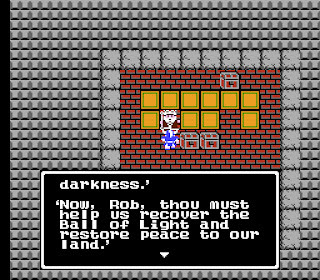 In the few minutes of free time I had here and there I decided to do some retro-gaming, playing a few old turn-based strategy games and RPGs. While playing, I came to a rather odd realization: I was actually enjoying the turn-based combat. Why is this odd? Isn't it normal to enjoy the games you play? Yes, it is, but this epiphany also made me realize that I have not been enjoying turn-based mechanics as they are so often implemented in newer games. In many recent titles (read JRPGs) that contain turn-based combat, I find myself mindlessly grinding through fight after fight, attempting only to get through it so I can get to the next Magic McGuffin and continue the story. 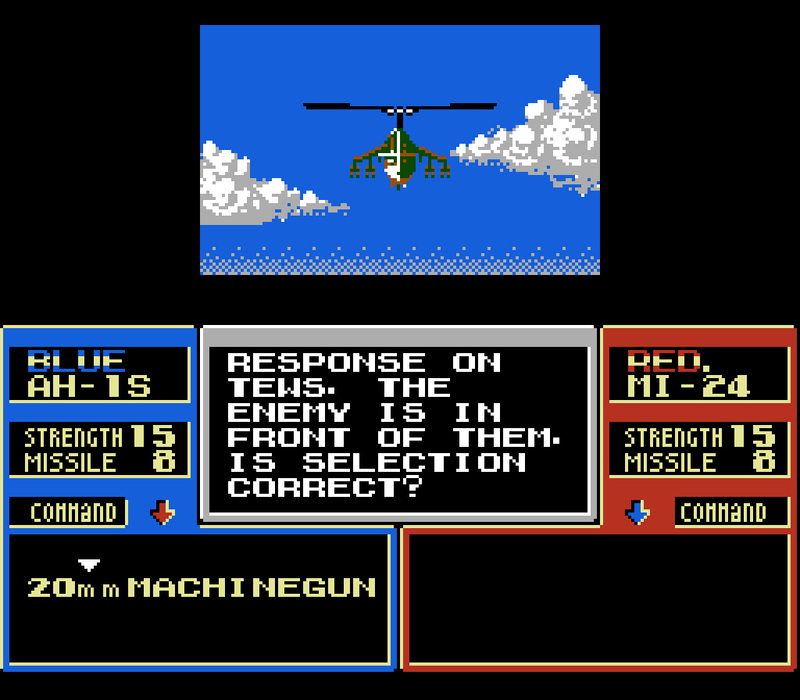 Yet, somehow, in these retro titles, I seem to enjoy the adventure, and combat is a bit more pleasurable to me. What is the difference between then and now? Well, not much, but it's the little things that make the big difference. For simplification of this topic, I'll discuss it in terms of the well known JRPG genre. 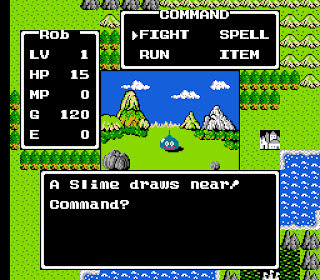 My first taste with turn-based combat systems came from a little title known as Dragon Quest. I was probably about 6 or 7 years old, and a friend loaned me the game, espousing it to be something new and interesting. 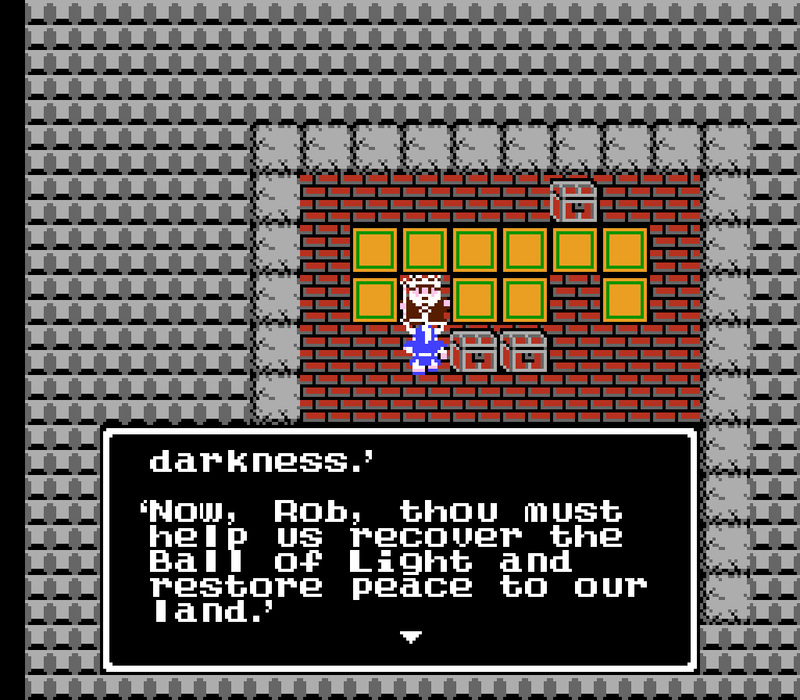 After the proper cartridge blowing ritual, I placed Dragon Quest (known then in America as Dragon Warrior) into my NES and was greeted with the simplistic title screen with its famous fanfare intro music. After naming my hero and pressing start, I was greeted by a king, pleading for my help in restoring peace to his kingdom. "He even used my name in his request!" I thought. I ventured outside after collecting a few bits of treasure and began speaking to the townspeople. Wow, there were townspeople, and they had things to say! What kind of world was this I had entered? This was no platformer, SHMUP, or 2D brawler (as so many titles at that time were), and while the view was overhead similar to Zelda and many other NES titles at the time, I found there was no button I could press to make my hero swing a sword or otherwise attack anything. This game was something different. Upon venturing outside of the kingdom and taking my first couple of steps, BAM! "A slime draws near!" What do I do? Fight? Run? Cast a spell? Use an item? My child-gamer brain had no concept of fleeing from a battle, so the only obvious choice was to attack. Fight it was. "Rob attacks! 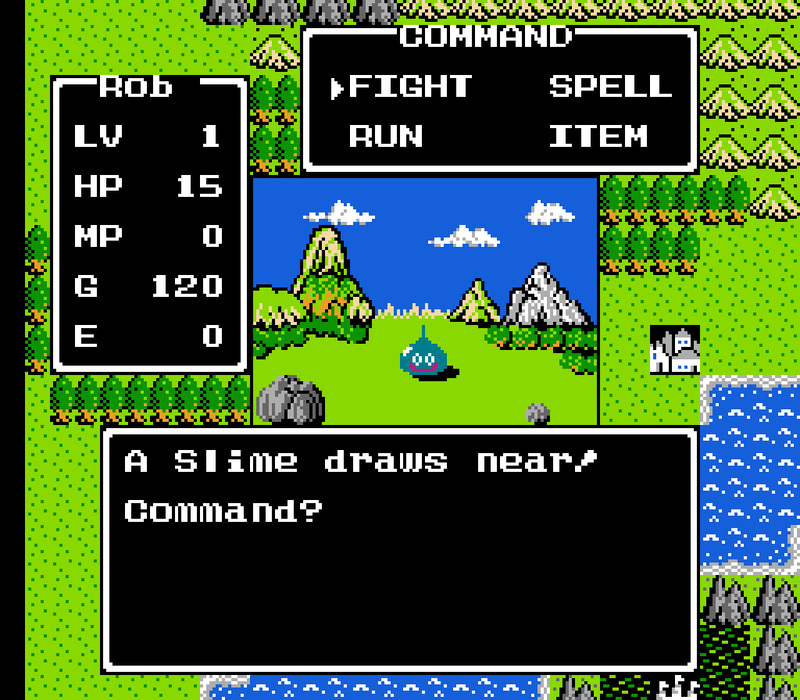 The Slime's Hit Point have been reduced by 2," said the text scrolling across the screen, typo and all. "Hit points? What are those?" I thought to myself. "The Slime attacks! Thy Hit decreased by 1" the game responds before allowing me to input anything else. "Oh no! That HP thing in the corner went down! Ohhh, I get it, that stands for Hit Points. It's like my health bar, only it's numbers. Well, two can play at this game." "Rob attacks! The Slime's Hit Point have been reduced by 1. Thou hast done well in defeating the Slime. Thy Experience increases by 1. Thy GOLD increases by 1." "Heck yeah, I'm awesome. I dunno what experience is, but I got some money!" In my mind, the battle between myself and the slime totally happened, sword in hand and all. This was some new breed of game, one in which towns had life, and battles, while not shown on screen, were in-depth and awesome (to my 7 year old brain). Apparently, the rest of the world thought so too, as this same system, very slightly altered since its introduction over 20 years ago, has been used in game after game after game. Sure, today it's hidden under fancy graphics and crazy sound effects, but this staple of the JRPG can be found everywhere. So, what has changed that makes this system so enjoyable in older titles, but makes me find it repulsive in new games? Put bluntly, games got easier. No, this is not the part where I go "back in my day we had to make it through the whole game without getting hit, with no continues or save points, uphill both ways!" I personally think making games easier and more accessible is often a good thing, but in this case, I have to say it has not done the genre well. 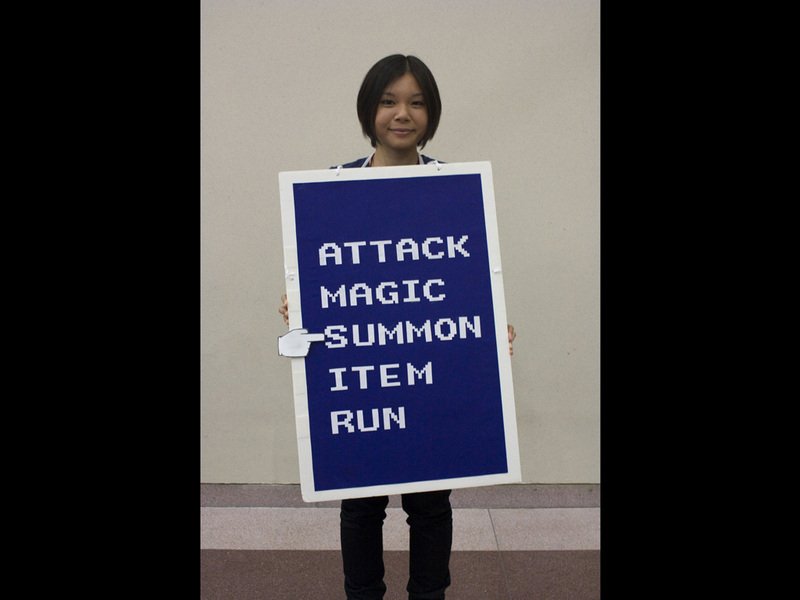 Turn-based battle mechanics are essentially a virtual implementation of strategic counter-top game battle mechanics, derived from games such as Dungeons and Dragons, the Warhammer series, the Magic: The Gathering card games, or heck, even Yu-Gi-Oh. What makes these games interesting is the strategy needed to play them well. Not their depth or complexity, though those are a nice topping, but the strategy is the foundation of the entire system. Modern JRPGs have gained battle systems that are infinitely deeper and more complicated than those in times past. There are huge varieties of monsters, enough stats to make me feel like I should be tracking my progress in Excel, and so many varieties of spells and attacks that it takes forever just to try them all out. But for all of this added content, developers have decided that in the name of "accessibility" it was necessary to give me a Win Button. In other words, they have taken all of this new depth and complexity and told me: “Hey, if you’re not into this kind of thing, just press the attack button a few times and the battle will be over soon.” The problem with this is that it becomes the critical path through the game. Sure, I could go out of my way and explore all of the options and abilities and unique things the game has to offer to make the battles easier, but why? When the default option is so effective, why bother doing anything else? 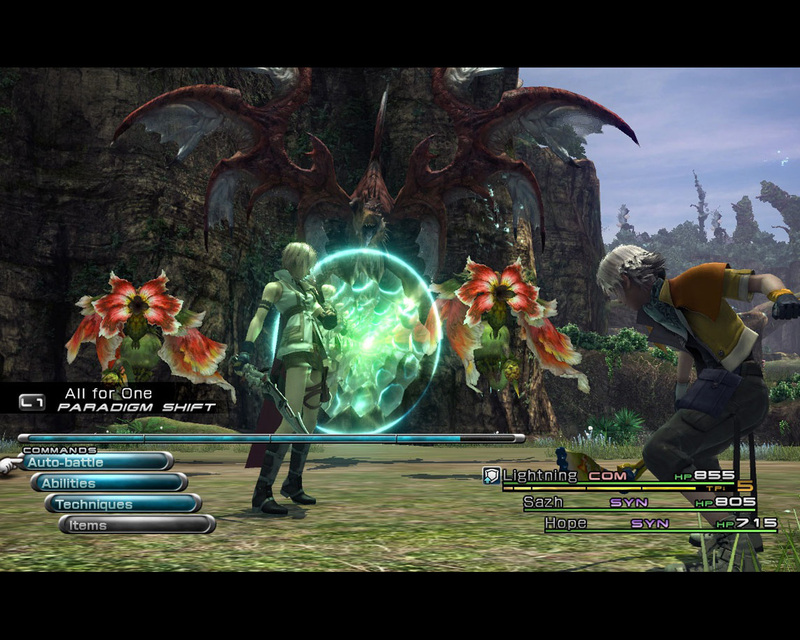 The most blatant example of this I have seen recently is in Final Fantasy XIII’s battle system. 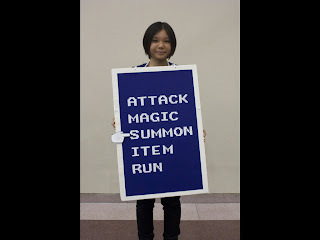 Not only is it possible to get through the entire game with a simple sequence of attacks (do physical damage to stop the stagger bar from falling quickly, switch to magic to stagger quickly, switch back to physical for lots of damage and instant win), but the game has an “Auto-Battle” button, where it will select a mostly effective sequence of attacks for you. This causes battles to devolve into nothing more than continually pressing the Win Button and waiting for the battle to be over. Pro-tip: If a player is spending most of their time attempting to skip through your game, you’re doing it wrong. The existence of this Win Button actually causes this deep, thought out system to feel completely shallow and pointless, simply because there is no real reason for me to delve into the true mechanics of it. The game does not provide adequate incentive to explore further strategies. 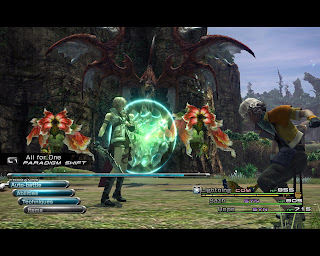 This failing is not limited solely to FFXIII, nor is it limited to only RPGs which provide an auto-battle mechanic, nor is it limited to the RPG genre itself. This failing is prevalent in all turn-based battle systems where there is a default path that will cause you to win in most cases. By giving the player a tool which works in most scenarios, you limit their desire to fully explore the depth of the system you have created for them. And while they would probably have fun if they explored your system a little further, most players won’t explore because there is no reason to. I do not suggest throwing accessibility out the window and harkening back to the turn-based combat systems of old. No, gaming has evolved, and with good reason. I would, however, suggest taking a look at what those titles of old did right. Allow the player easy choices in the very beginning of the game, or, don't offer them any choices but the easy choices in the beginning. Give them the Win Button only long enough for them to learn the other important things about your game, then wean them from it quickly. By the time the player is a couple of hours into your game, the mindless alternative for combat should be completely gone. 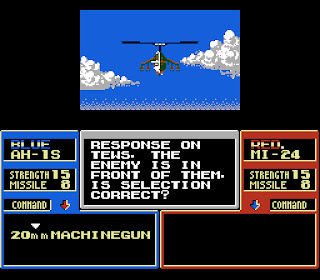 Repeatedly bashing the Win Button should work well as the player gets acclimated to your world, but this tactic should result in lost battles and dangerous situations should the player continue to use it as the game progresses. There is no fault in making your game harder as it progresses, even if this makes it less "accessible." You'd be surprised at how many players will try something more than once, if for no other reason than the fact that they managed to conquer earlier challenges (in this case with the help of the Win Button). In short, turn-based battles are a time-tested and very usable mechanic. So long as you don’t provide your player with any one particular dominant strategy, the battles can remain fresh and interesting, requiring thought and participation. But the second you introduce an easily usable dominant strategy into a system built on planning and problem solving, you negate the entire experience. It becomes no longer fun. To my fellow developers out there, I encourage you to take heed when trying to make these kinds of systems “accessible,” and remember where they came from and what makes them fun. Till next time, drop a comment or two in the comments section, let me know what you think.